Atlanta Wedding Photographers are on the Street! I am so blessed to be a Atlanta wedding photographer. This week was a Atlanta shoot to remember. We covered a lot of territory through out the metro area. We even did a trash the dress shoot at Emory. Lets start as I always do in the morning. I am a early riser and love the morning light! We started at the parking deck at the Georgia Public Broadcasting building. I know what you are thinking! David a parking deck for a photo location? and you could not be more wrong. As a Atlanta wedding photographer you are looking for places that show case the city. The top of the parking deck as a awesome view of the Atlanta skyline! The early morning skyline is a sight to behold with the lights and skyscrapers making a perfect backdrop for some great photography. We then went to the streets. As a Atlanta wedding photographer I love street photography! Going to the street makes for some great urban wedding photography. When you are there right at sunrise it is the streets are abandoned and Atlanta is your city to do as you please. We went down to 14th street and started there. It was right down from the Silver Skillet another Atlanta landmark in the heart of the city. As always we were looking at the light and working it to our advantage. When shooting in the morning the sun is low in the sky and makes for some wonderful lighting and back lights the bride beautifully. So we went up and down the street and stopped when we had a great background and great light. If you are a Atlanta wedding photographer you have go to Centennial Olympic Park. Centennial Park is another Atlanta landmark. We parked in the middle of the two portions of the park north of the rings fountain and the Coke, Civil rights and Georgia Aquarium. That is a sort of high spot in the city so you have a great view of the buildings in the downtown area. Once again since it was so early in the morning no one was around. We did some fun Beatles "Abby Road" sort of shots. As we were shooting the bride started throwing her bouquet I said that is so cool! Lets do a couple of these wedding photos in the street as you cross. As she got to about the middle of the Atlanta street in Centennial Olympic Park the bride threw her bouquet and we got these great shots. We then went to Lullwater Park at Emory. Lullwater park is another Atlanta landmark in the heart of the Emory campus and Emory Hospital. This where we did the the Trash the dress shoot. A trash the dress shoot is exactly what you think it is. It is where you will trash the wedding dress and have fun doing it! We went down to the creek and just basically had some fun. 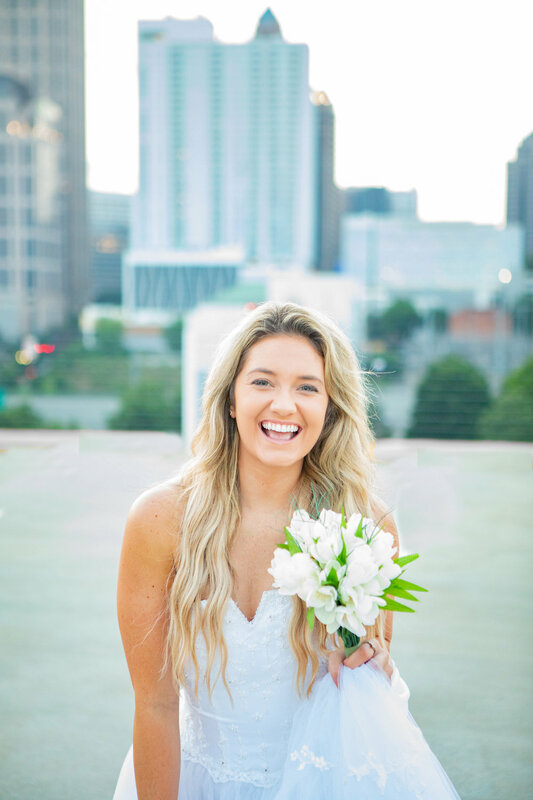 As a Atlanta wedding photographer I think it liberating seeing the bride let her hair down after the pressures of the wedding and just have some fun! You don't have to worry about being perfect just want to have fun! I hope you enjoy this wedding photographers blog. Please come back often and see what is going on! I would love to hear from you please go to the contact section and drop me a line!